Do you ever get tired of knocking over bullets when setting them up in your lube pan? Have you ever set the bullets too close together and upon knocking them out pulled lube out of the bullet grooves? Well, put those issues to bed with the SPG lube pan bullet spacer. This handy little item sets your pan lubing session up for success. It spaces your 40/45 cal bullets at the proper spacing without knocking them over. 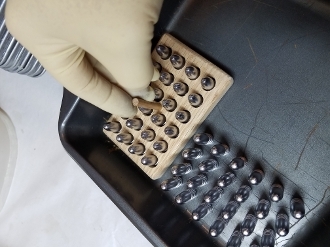 Slide the block up and move the block to another quarter of your favorite brownie pan and drop more perfectly spaced bullets in seconds. Pull the block off and do it again. Block is made of quality oak hardwood. So simple, yet so handy. Why didn't we do this years ago? You wont regret picking up one of these.